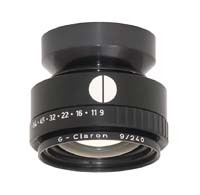 Although G-Claron lenses were primarily intended for graphic arts use, they have proven to be a versatile lens for a variety of applications. With their apochromatic flat field design, they are outstanding for tabletop and macrophotography. Because of their compact size and light weight they have also been a popular lens for field photography. And since they are flat field, they can be used as a large format enlarging lens. Supplied in barrel mount with 39 x .75mm lock ring. Suggested Film Format (at 1:1) 14"x17"
Suggested Film Format (at ∞) 5"x7"